Del Haven Jewelers has been the jewelry experts since 1973. We pride ourselves in the quality and workmanship of our merchandise, repairs and custom designs. It is our priority that every customer be not only happy but also well informed about their jewelry purchases and repairs. We are eager to have the chance to serve you and be able to show you our established reputation of service, quality and excellent workmanship. Del Haven Jewelers, the jewelry experts since 1973 is a 2nd generation, family owned and operated, full service jeweler for over 40 years. Our original showroom was opened in Wilmington, Delaware back in 1973 by Francis Pepeta Sr.
Fran Sr. began his career in the jewelry business in 1958 as an apprentice at Jack Coonin and Company. Under Mr. Coonin, Fran Sr. learned the art and skill of jewelry repair, design and manufacture. Through the years many of our area jewelers have apprenticed under Fran Sr. as he once did under Mr. Coonin. In 1987, Fran Jr. began his career apprenticing under his father and continues to collaborate, side-by-side, today. 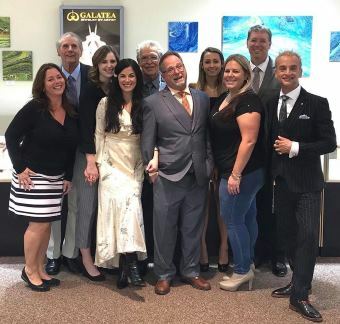 Fran Jr. attended the Gemological Institute of America in 1997 becoming certified in grading diamonds and has completed the LaserStar training course for jewelry applications. Rounding out our staff is Jen Brown who has been involved in all aspects of the jewelry business since 1990. We invite you to come and visit our beautiful showroom and full service repair shop. Our experienced staff is eager to serve you and show you our established reputation of service, quality and excellent workmanship. Thank you for visitng us online and we look forward to the opportunity to serve you.